There are two intersecting circles G1 and G2 with centres at A and B respectively. They meet at points D and G. You choose any two points C and F on the cirle G1. From C, you draw a line through D to meet G2 at E. Through E, draw a line passing through G to meeet G1 at J. Now, you draw a line from F through G to meet G2 at H. From H, you draw a line through D to meet the circle circle at I. Connect C and F amd I and J. Prove that IJ is parallel to CF. I changed the label of F to D. So now, it's prove that CD is parallel to IJ. Start out with angle JCI, which is equal to angle JDI. So now, we only have to show that angle JDC is equal to angle ICD and we get an isosceles trapezium CDIJ and we're done. Angle JDC is equal to angle JFC which is equal to HFG which is equal to angle HEG, which is equal to angle IED which is equal to angle ICD. This is just a quick hunch, given two such circles G1 and G2 intersecting at points D, G, given any point E on G2, and extending lines ED and EG to meet G1 at points C and J, the chord length of CJ is constant. The rest of the proof follows. I'll back to this a little later with maybe a graphic to show this. Okay, here's the graphic. With a bit of angle chasing, it's easy to show that, given angles \(a, b\) formed by two intersecting circles, for any \(x\) formed by arbitrary point \(E\), the angle subtended by chord \(CJ\) is \(a+b\). Therefore, the length of chord \(CJ\) is constant for any \(E\). With this, it's straightforward to show that \(IJ\) is parallel to \(GF\). Wow! Really awesome proof. This question is not original and is from last year's entrance exam to a college over here. I couldn't solve it when I was going through the paper yesterday. I too tried to relate it to an isosceles trapezium, but I gave up. I had to look up the solution to this question to get the method. Their method made it seem so simple that I felt like smacking myself in the head. I have a figure that I'll post which makes it really obvious. I changed the labels, so now it's prove that CD is parallel to IJ. If you're up for one more challenge, which is sort of related to this problem, check out this one here. It might help to make a clearer picture using Geogebra. I adjusted the points so that it'd look harder, but sometimes in geometry, the best investment of your time is in drawing the figure. That's an interesting Geom question! 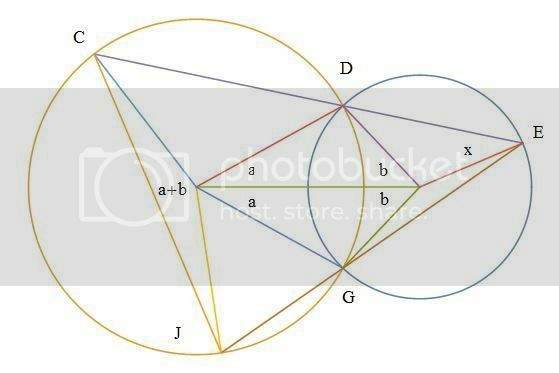 It is an interesting GEOMETRIC question, in which I had seen!!!!!! I think you misunderstood me. I meant to say why didn't you post it yet?